College degree? Many Pittsburgh-area jobs in the next decade may not require one. Dave Keefer is a sixth-grade Earth science teacher at Greensburg Salem Middle School. His career in education is partly a product of how labor and success have been defined in recent decades. Keefer took his father’s advice, graduating from the Indiana University of Pennsylvania with a degree in education and later earning a master’s degree from Gannon University. Many have and still view higher education as the only ticket to a stable, prosperous career. But it’s not so clear-cut anymore. As the Baby Boomers continue to retire, workforce and regional development experts estimate that the region will face a shortfall of 80,000 qualified workers by 2025. Much of the shortage will affect growing fields such as health care, information technology [IT] and robotics. But this lack of skilled workers is especially prominent when it comes to jobs requiring what an Allegheny Conference on Community Development report calls “Sub-BA credentials,” jobs that don’t require a college degree. For example, physical therapy assistant positions are projected to grow by 31 percent and electrical power line installers by 20 percent. “It’s almost going against the American Dream of doing better than the generation before you." It’s increasingly possible to earn a living wage without attending college, but recent high school graduates often lack the skills to enter those occupations and the awareness that such career opportunities exist in the first place. Several for-profit and nonprofit organizations in the region have stepped in to address the various barriers to high school graduates gaining skilled employment, including lack of technical skills, career readiness or “soft skills,” and contemporary career awareness. At a March event organized by the Consortium for Public Education designed to boost educators’ career awareness in technical fields, Keefer reflected on the changing perceptions of success. What ever happened to wood shop and welding classes in high school? Their disappearance is attributable to several factors. Academic requirements for a high school diploma increased. 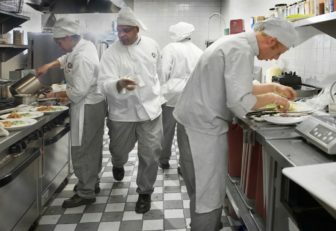 Funding for CTE [Career Technical Education] programs declined nationally. And the perception that all young people should pursue a college education spread. In Pittsburgh’s 10-county footprint, the conference report states that CTE programs for high-demand occupations tend to be under-enrolled. For example, CTE programs in cosmetology, a low-demand occupation with a median annual income of $24,850, enroll almost four times more students than programs for machine tool technology, a high-demand profession. Machinists earn a median annual income of $42,600, according to the Bureau of Labor Statistics. Bidwell Training Center, located in Chateau on Pittsburgh’s North Side, is working to change the trend. The center offers career-oriented technical training at no cost to Pennsylvania residents with either a G.E.D. or high school diploma. Bidwell accommodates up to 120 students at a time with a range of programs, from culinary arts and horticulture technology to medical claims processing and training for pharmacy and laboratory technicians. Valerie Njie, the executive director and senior vice president of the Bidwell Training Center, said the key to the center’s success is their collaboration with industry. “What has brought us to this point is that we continue to work with industry… Usually when people open up schools and programs, they design a program and then they go and they try to sell it,” Njie said. In contrast, Bidwell works with industry leaders to develop programs to facilitate employment in high-demand occupations. “When [our] students graduate, they’re qualified, because the industry told us the skills they have to have,” Njie said. Other local educational organizations are also working to provide technical sub-BA credentials. The Community College of Allegheny County [CCAC] continues to build its forthcoming Workforce Training Center. Theresa Bryant, CCAC’s vice president for workforce development, said the new center, planned for Pittsburgh’s North Side, will facilitate “a dramatic expansion of the culinary program that we currently offer at that campus.” The center will also offer more opportunities for training in advanced manufacturing, such as additive manufacturing and advanced robotics training, she said. Nazareth College and Career Prep, an independent Catholic high school in the Allegheny County borough of Emsworth, is slated to be the first high school in Western Pennsylvania with a certified pre-apprenticeship training program. After 10th grade, students will be able to declare a concentration in one of three areas. A mechatronics program is scheduled to launch in the fall. The school is “in conversation” about programs on allied healthcare and process technology, a course of study designed to lead to jobs at Shell’s ethane cracker plant, which is currently under construction. 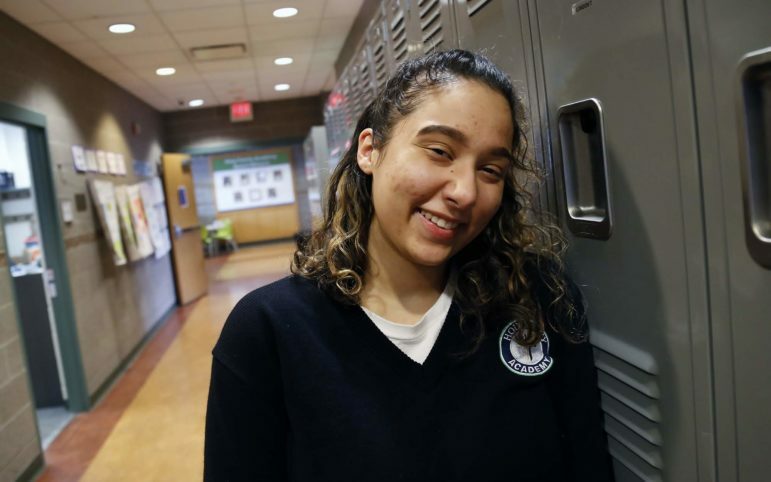 According to the head of school and chief learning officer, Lisa Abel-Palmieri, about 80 percent of Nazareth’s 170 students are on the four-year college pathway, but for the students in this spring’s graduating class who planned to go directly into the workforce, “We’re not worried about them being able to pass the entrance exam for the carpenter’s union or for the trades they’re interested in,” she said. Kaylee Nicotero is a rising senior at Nazareth. There, she said she’s had a chance to develop “soft skills” — defined by the U.S. Chamber of Commerce Foundation as a “widely coveted category of skills,” including leadership, teamwork, work ethic, critical thinking and interpersonal communication. These skills are widely said to be challenging to teach in a traditional school setting. Nicotero said she “never knew how to code or how computers ran before” her internship at EDGE, a school-run startup working on game design and virtual reality. Initially, “I did not think I was capable of doing it,” she said. Nicotero’s willingness to try new things and ability to confidently navigate unfamiliar territory are among the soft skills she’s gained through participation in Nazareth’s corporate internship program. “I grew in a sense that I was more comfortable doing things I’ve never done before or didn’t have a background in,” she said. All Nazareth students spend one day a week at internship placement. Students are matched with internship partners based on several factors, including student interests and strengths as well as feedback from parents and teachers. The internship program’s business partners not only provide mentorship, but for-profit partners also contribute to interns’ tuition fees at Nazareth. City Charter High School is another local school prioritizing career readiness for its students. Internship Manager Patti Kretschman said City Charter encourages ninth-grade students to explore their career interests and personal values. Sophomore year “mimics the workplace,” with students looking at job postings, writing cover letters and resumes and going on mock interviews. In 11th grade, students assemble an “individual packet,” including an unofficial transcript, letters of recommendation and long and short personal essays. They also practice filling out the Common Application (an undergraduate college application accepted by hundreds of colleges and universities) and sample job applications. Each year, an average of 29,000 people in the Pittsburgh region will retire from the workforce, and 5,000 new jobs will be created, resulting in 340,000 job openings over the next 10 years. At the same time, our talent pipeline is only expected to produce about 260,000 workers, resulting in the shortfall. In 12th grade, the format of students’ days change to emphasize independence and self-sufficiency. Students learn through lectures, study groups and seminars as well as independent and service learning projects. In their internship placements, Kretschman said she emphasizes students’ ability to consistently show up on time, communicate properly and be positive and respectful. 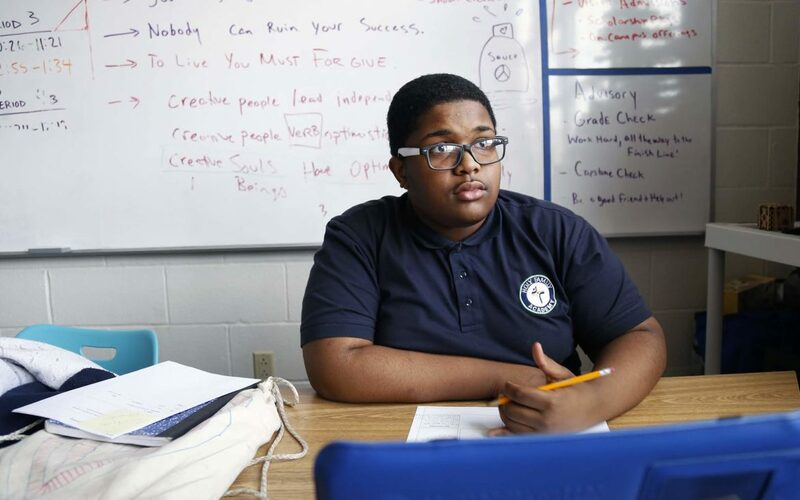 City Charter enlists internship partners as mentors who monitor students’ performance and help them with “navigating the workplace,” negotiating tricky situations such as when to solve your own problems at work and when to ask for help. Kretschman reports the school has about 140 internship partners, although not every placement hosts a student each semester. Often, parents and teachers are unaware of the possibility of skilled employment without a college degree. “Teachers have come to us now for the last three to four years repeatedly saying, ‘It’s hard for us to help guide our students or even to prepare our students when we don’t know what the opportunities are or what the needs are,’” said Mary Kay Babyak, executive director of the Consortium for Public Education. 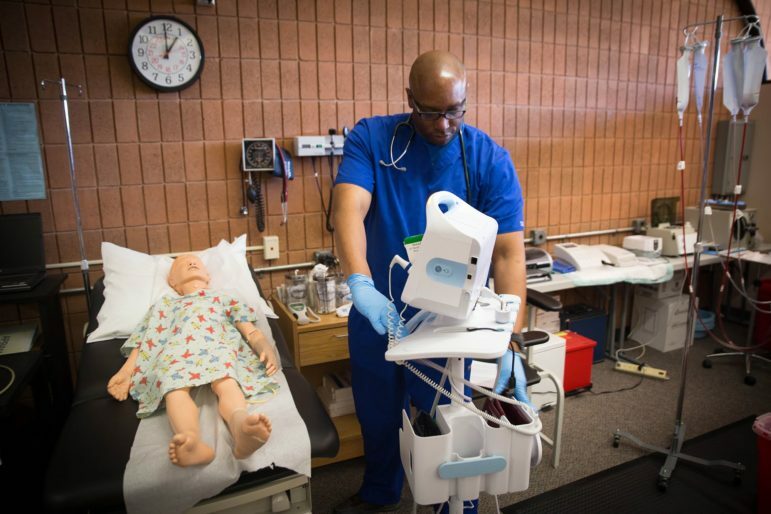 The consortium is working to increase career awareness by exposing educators to current career opportunities that don’t require a college degree in high-growth professions. In response to what she describes as an “extremely high” interest level from both schools and businesses, the consortium is in the process of developing programs like “Educator in the Workforce” that allow educators and industry leaders to collaborate on creating clearer pathways for students from high school to skilled employment. The first trial run of that program on March 28 involved 25 educators from six districts. Groups visited Mascaro Construction, Duquesne Light, Peoples Natural Gas or U.S. Steel to learn of the opportunities those businesses offer for qualified individuals without bachelor’s degrees. After visiting one of four business sites, educators reconvened to discuss what they learned and how the K-12 system can better prepare students to enter high-demand professions. David Zili, principal at Greensburg Salem High School, said, “I think kids can wrap their brain around a problem more than they can just wrap it around, let’s say, science content,” suggesting that teachers frame instruction for some students around industrial problem-solving. John Mascaro Jr., the president and CEO of Mascaro Construction, spoke about his desire to counter “the stereotype of the dirty hands laborer” by exposing students to the reality of life as a professional laborer. Fewer than 10 percent of local businesses surveyed by the Allegheny Conference for its report have made or are considering outreach efforts to K-12 schools. Mascaro, at the March event, said they’re willing to start spreading awareness of the variety of careers available in construction. PNC, UPMC and FedEx are already spreading the word for their respective job opportunities. Joshua Stewart, PNC’s director of college, high school and diversity recruiting/development programs, is developing an outreach program to reach high school seniors and discuss local entry-level positions available after graduation. Through this program, which Stewart calls “a pilot of a pilot,” representatives from PNC, UPMC and FedEx conduct monthly visits to local high schools to talk with seniors on track to graduate who may be interested in alternatives to college. This year, the program has reached 100 students across five school districts. Stewart said he hopes to expand the program to 11th-grade students in the future. Pennsylvania State Rep. Austin Davis, D-Allegheny, introduced in March a bill that would allocate millions of dollars in funding to encourage more programs like the one initiated by PNC, UPMC and FedEx. Alongside funds designated to modernize the state’s CTE system, the bill would authorize $8 million for college and career counseling in middle and high schools. Jordana Rosenfeld was a spring 2018 intern for PublicSource. She is now working as a community outreach specialist at the Mon Valley Initiative. She can be reached at jordanarosenfeld@gmail.com. I wish that I had these sorts of resources and programs at my school when I was preparing for college. Many of my friends complain about the money they needed to go to college but not all of them ended up somewhere they want to be. It makes millennials (are kids these days still millennials?) feel like they’ve been scammed but really I think we were mostly uninformed. Thats excellent for students, but what about todays adults who were told not to go into trades decades ago? In our prime working years, our jobs are being automated or offshored to cheaper foreign labor. Are there any programs to help “re-tool” adults looking for a career change?